Available from the Google Play™ store, the SanDisk® Memory Zone app lets you view, access, and back up all the files from your phone's memory in one location. It can also automatically move files from your device to your drive to free up space. Instantly free up space on your Android smartphoneThe SanDisk Ultra® Dual Drive m3.0 makes it easy to transfer content from your phone to your computer. 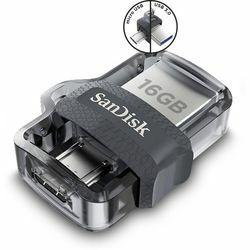 With a micro-USB connector on one end and a USB 3.0 connector on the other, the drive lets you move content easily between your devices—from your Android™ smartphone or tablet to your laptop, PC or Mac computer.Compatible with OTG-enabled Android DevicesThe SanDisk Ultra® Dual Drive m3.0 is compatible with Android™ smartphones and tablets featuring OTG (On-The-Go) USB support.Free up Memory on Your Smartphone and TabletQuickly free up space on your Android smartphone or tablet so you can take more pictures and videos.Easily Move Content Between Computers and Android DevicesThe SanDisk Ultra Dual Drive m3.0 lets you move and share files between Android devices and desktop or laptop computers.Dual micro-USB and USB 3.0 ConnectorsSleek, retractable design offers both micro-USB and USB 3.0 connectors. The USB 3.0 connector is high-performance and backward-compatible with USB 2.0 ports.High-speed USB 3.0 for Super-Fast File Transfers of up to 150MB/sHigh-speed USB 3.0 lets you transfer a full-length movie to the drive faster than with a standard USB 2.0 drive, up to 150MB/sSanDisk Memory Zone App for Easy File ManagementAvailable from the Google Play™ store, the SanDisk® Memory Zone app lets you view, access, and back up all the files from your phone's memory in one location. It can also automatically move files from your device to your drive to free up space.